Hrabovsky, Pavlo [Hrabovs’kyj], b 11 September 1864 in Pushkarne, Okhtyrka county, Kharkiv gubernia, d 12 December 1902 in Tobolsk, Siberia. (Photo: Pavlo Hrabovsky.) Poet, translator, journalist, and revolutionary. For his radical populist involvement, he was expelled from the Kharkiv Theological Seminary in 1882 and forced to live in Pushkarne under police surveillance. He was imprisoned and then exiled to Irkutsk gubernia in Siberia in 1886. 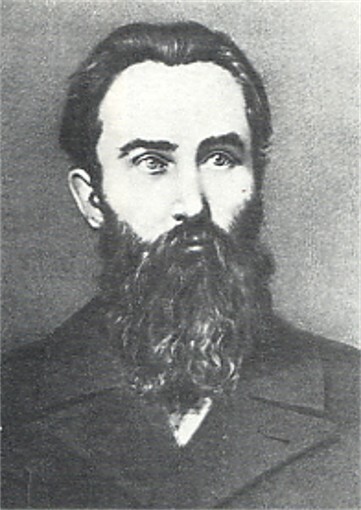 In 1889, in Irkutsk, he was again imprisoned; released in 1893, he was forced to live in Viliuisk, Yakutsk (from 1897), and Tobolsk (from 1899), where he died of a pulmonary illness. Hrabovsky corresponded from prison with Galicia's Ukrainians, who published his poetry and literary criticism in thejournal Pravda, Zoria (Lviv), Dzvinok, Narod, Zhytie i slovo, and Literaturno-naukovyi vistnyk. As a poet, he rejected ‘art for art's sake’ and wrote mainly social, political, and patriotic verse; he sought out consonant motifs in the works of many Russian, European, and American poets he translated. His collections of original verse—Prolisok (The Glade, 1894) and Z pivnochi (From the North, 1896)—and of translations—Tvory Ivana Suryka (The Works of Ivan Surikov, 1894), Z chuzhoho polia (From a Foreign Field, 1895), and Dolia (Fate, 1897)—were all published in Lviv. The collection Kobza and the long poem Khoma Bahlai, a paraphrase of Robert Burns, were published in Chernihiv in 1898. Hrabovsky's works have been republished numerous times in Soviet Ukraine; three volumes of his collected works appeared in Kyiv in 1959–60. Studies of his life and work have been written by Oleksander Kyselov (1951, 1959, 1972), Yu. Bukhalov (1957), V. Povazhan (1966) and Mykola Syvachenko (1988) as have many articles; a bibliography by Myroslav Moroz appeared in 1964. A referral to this page is found in 15 entries.